How would you like to keep clean and green a 419-acre backyard — complete with lush gardens — that’s vast, stunning and constantly in need of watering, weeding, mulching, fertilizing and pruning? 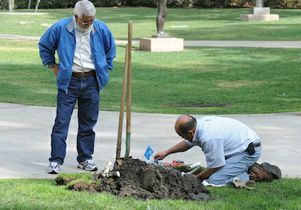 It takes Rich Ohara a month to slowly walk the entire campus, checking up on the health of all of UCLA's trees, bushes, flowering plants and grass. Photos by Rich Schmitt. Welcome to Rich Ohara’s world. 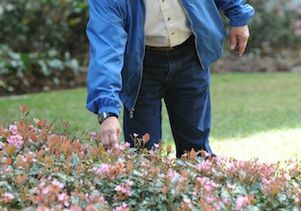 Senior grounds superintendent for UCLA’s Facilities Management, Ohara has spent the past 18 years tending one of the most beautiful college campuses in the world. A licensed landscape architect (only one of three at UC campuses), Ohara oversees a team of nearly 80 groundskeepers, irrigation mechanics, equipment operators and laborers, plus tree trimmers, pest control advisers and other contractors. Ohara has been digging in the dirt since elementary school, when his family, who lived in Torrance, headed to northern California every summer. “My great-uncle grew garlic and artichokes up in the Castroville. We helped pick them,” he recalled, rolling up his shirt sleeve to reveal scars from the bruising effort. 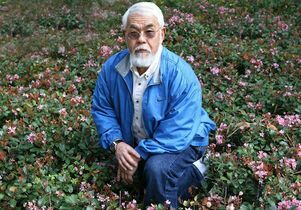 His Japanese-American father worked in landscape construction, starting life over after World War II when the U.S. government seized Ohara’s parents’ 20 acres of land in Culver City, which at that time was largely agricultural. His parents and two older siblings were sent (before Ohara’s birth) to Heart Mountain, a bleak Japanese-American internment camp in Wyoming, where his father was put to work in local coal mines and farms. Meanwhile, two of his uncles served in America's armed forces: One in the 442nd Infantry, the highly decorated Asian-American Army combat unit, and the other, also highly decorated, in the Navy as a translator in Japan. This irony is not lost on Ohara, who in his office displays a photo of his mother and siblings standing outside a rickety internment camp shack and, in a photo beside it, his 442nd Infantry uncle decked out as a war hero. 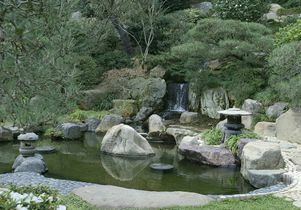 As a youngster after the war, Ohara recalled, “I’d go with my father and see old-timers doing landscape work and would think, ‘I could do that.’ ” He received a bachelor’s degree in horticulture and a master’s in landscape architecture at Cal Poly Pomona and worked in landscape architecture and construction. He worked for almost a decade with the Army Corps of Engineers, where he helped design recreational areas adjacent to Corps-built flood control basins, among them, parks in the Sepulveda Dam Basin in Van Nuys. Ohara’s wide-ranging experience serves him well in his attention to every tree, plant, flower and blade of grass on campus, from the residence halls to classroom buildings, from the Sculpture Garden to the intramural athletics field — and beyond the campus to the Hannah Carter Japanese Garden and the Clark Memorial Library. “Monitor ficus trees. Pines at Royce,” he has written to himself on a wall-size whiteboard in his office. Colorful flower seed packets for Flower Carpet White Ground Cover Roses and other varieties are pinned to his bulletin board. Sprinkler valves and irrigation tubing spill out of a bin. When he’s not at his desk, he grabs his cell phone, pager and two-way radio and starts walking — up to two hours a day to personally inspect every inch of the campus terrain. 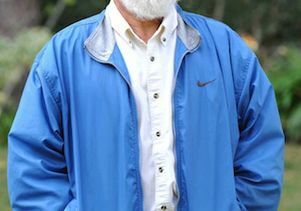 “I walk this entire campus once a month,” he said, his route starting at the corner of Hilgard Avenue and Sunset Boulevard, making a stop at the Chancellor’s Residence to inspect lawns and other landscaping, then criss-crossing his way to South Campus. Should he spot an errant dandelion weed, he said. “I’ll pull it out.” And should he come upon a discarded soda can or candy wrapper on the sidewalk or grass, “I’ll pick it up,” he says, because he is also tuned into trash. Keeping the campus clean is something Ohara is especially proud of — not just for the compliments he and his staff receive but for the environmental benefits. A street sweeper from his department rolls out every morning at 4 a.m. to remove dirt and litter from every street on campus, which keeps refuse out of storm drains and, hence, out of the Pacific Ocean. Sustainability, in fact, is high on Ohara’s list. “We try to keep everything natural here,” he said. Ohara uses synthetic organic fertilizer that doesn’t leech out into groundwater, preventing contamination. To reduce water use, his crews will spend the next several years gradually replacing tens of thousands of water sprinklers with miles of irrigation tubing for an irrigation drip system that sends water directly to the root balls of trees and other plants. They’re also installing high-efficiency sprayheads to water grass. The high-tech spray heads even allow Ohara to monitor exactly how much water they use. His goal? Roughly two inches of water per week required to sustain grass. Ohara is also exploring ways to trap rainwater for reuse. Mulching plant and flower beds also reduces water use, as well as make plants more pest-resistant. A steady supply of mulch comes from tree trimmings and other plant refuse. But many plants are recycled: Flowers that have overgrown their beds in one area are thinned out and transplanted in another. “Nothing leaves the campus, which reduces the waste stream,” he said. He’s also trying to “cut out the mow, blow and go mentality,” referring to the use of leaf-blowers. The problem, he said, is one of cost-efficiency. Using blowers — which are electric and quieter — groundskeepers can clean up to 12 times more than they can without them. One upcoming green project of which Ohara is particularly proud is the new South Campus Student Center that will replace the Bombshelter. Ohara worked with Capital Programs to develop plans for the campus’s first-ever roof garden. Making use of native plants like chaparral, scrub and coastal sage scrub, the garden, once it matures, will be self-sustaining. “We won't even need to water it," Ohara said. The occasional heart-wrenching problem also falls within his domain — among them the loss four years ago of a beautiful pine that had once stood tall beside Royce Hall. For some time, Ohara had been nursing the old tree — pruning it, propping it up with cables — because it had grown too heavy for its own good. Then, during a violent windstorm, the tree was violently split in two. “Not good,” Ohara recalled of his feelings when that occurred. But it wasn’t simply because the pine was special to him, but because all of the trees and plants on campus are. “All of them,” he said. “All are favorites to me.”For more information about campus landscaping, see Ohara’s department website.